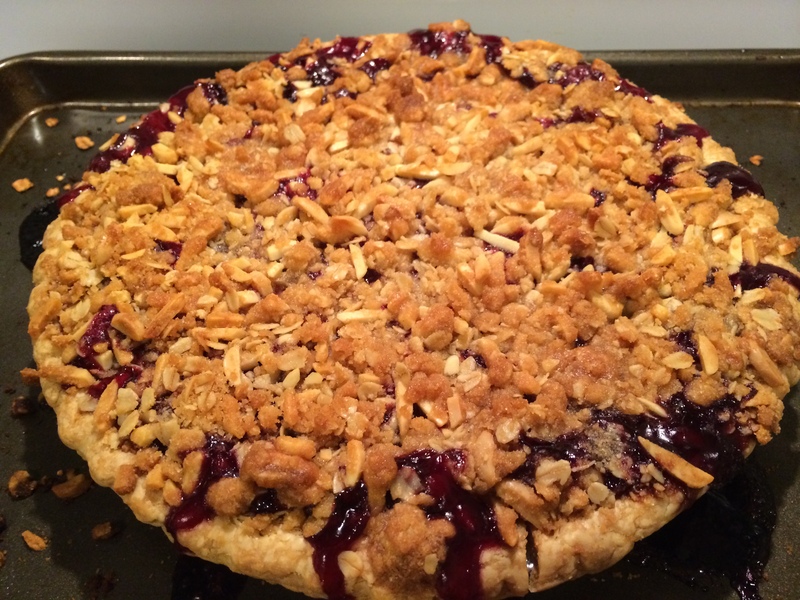 Cherry Pie is taken to a new level with this Cherry Almond Crumb Pie, a fresh cherry filled pie generously sprinkled with an almond-oat crumb topping. Who needs canned cherry pie filling when you can make your own? I have never made a cherry pie before. I attempted to make these weird little mini cherry pies a while back when I first started blogging, but they used canned filling and weren’t the prettiest things I’ve ever made. But this cherry pie? A world of difference! My roommate had her family over for Father’s Day BBQ last month and our friend Jesse was in charge of dessert. She brought this pie. We all basically died over how delicious it was. We had pineapple upside-down cake and even a chocolate ganache cake, but the cherry pie was gone almost as fast as it went out on the table. Those other desserts didn’t stand a chance next to this winner. So natrally I had to bug her for the recipe she used from Allrecipes and make it myself. 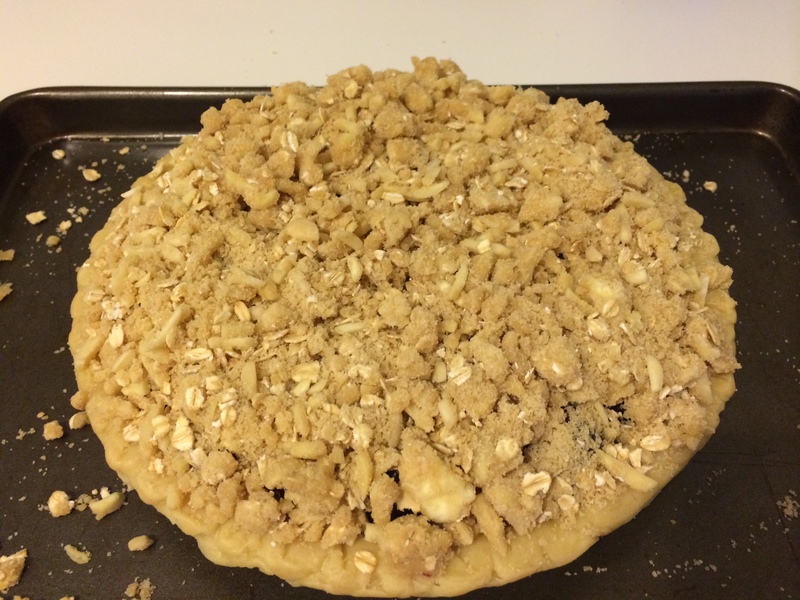 I didn’t change anything about the recipe for my Cherry Almond Crumble Pie, except that I cheated and used pre-made frozen pie crust. Whatever. I love that little Pillsbury Dough Boy! I’m kind of jealous of my #LeftoversClub partner for this month, Charlotte Turtle from Pickle. 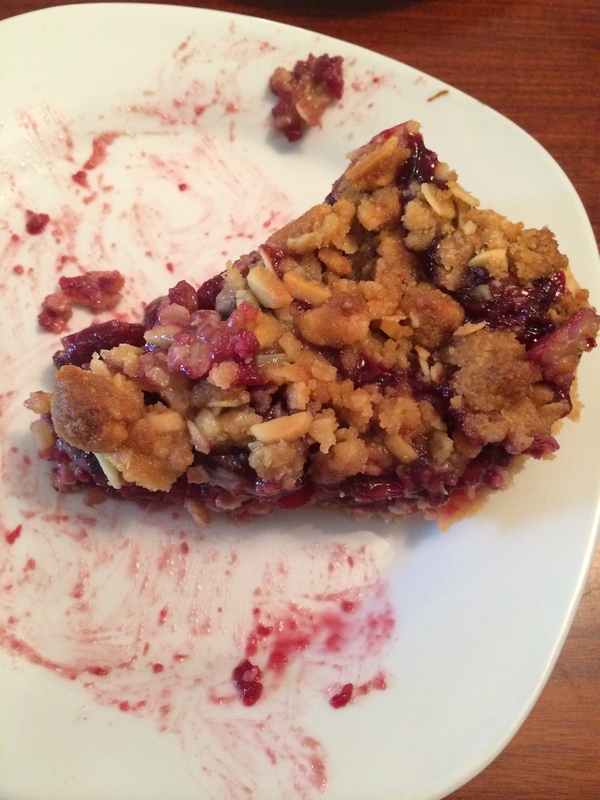 She gets to have the first-time experience with this Cherry Almond Crumble Pie just like I did last month. Charlotte’s blog is more than food — she’s got everything from crafts and gardening to music and sewing on her site. She’s a jack of all trades! One of the things I like most about being in the #LeftoversClub is getting to meet these awesome bloggers each month. If you want to participate in our monthly food swaps, check out The Leftovers Club and sign up! Now please stop everything you’re doing and make this Cherry Almond Crumble Pie. It takes about 30 minutes to prep and an hour and 15 minutes to bake. So it may require some planning ahead timing-wise, but it’s so freaking worth every minute spent in the kitchen. You’ll thank me later. I love the combo of cherries and almonds!!! Me toooo, Elizabeth. The only thing this might be missing is a big scoop of vanilla ice cream on top! I just made a cherry pie because my husband had been nagging me to make one and I could tell he didn’t like it although he was trying his best to be polite. I’m going to try this recipe. It looks yummy! I hope he likes this one! Wish I had this recipe for our Bourbon and Pie in July party last weekend! Oh well, I’ll just have to make up another excuse to make it 😉 And yes, the vanilla ice cream would be an absolute must! 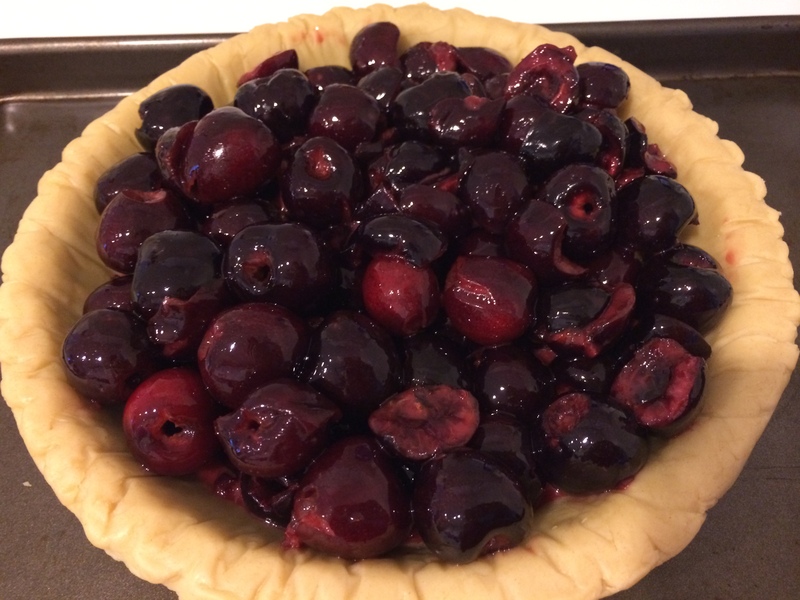 Ohhh I bet soaking the cherries in bourbon for this pie would be so good. Omg…. must. do. Now that is something I could DEFINITELY get between. And bourbon whipped cream! Now that is something I could DEFINITELY get behind. And bourbon whipped cream! This looks so good – I’m usually not huge on cherry pie, because I don’t love the canned filling. But this filling I would DEFINITELY chow down on. I don’t like the canned stuff either, Elizabeth, it tastes so fake. But this is so simple and REAL…just cherries, lemon, and sugar! Cherry pie is one of my favorites. This sounds so delicious! That’s one gorgeous looking pie! Lucky girl your partner is. 😉 So excited you’re right around the corner from me. That is so funny! Glad to have found your blog. I know! Small world, so great to “meet” you! Perfect summer dessert! 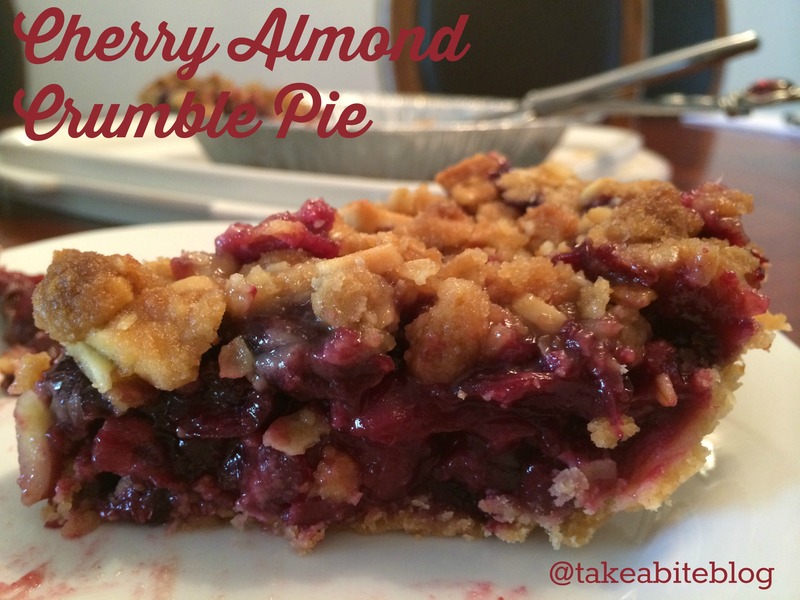 The crumble on this pie looks gorgeous! I love this recipe!! 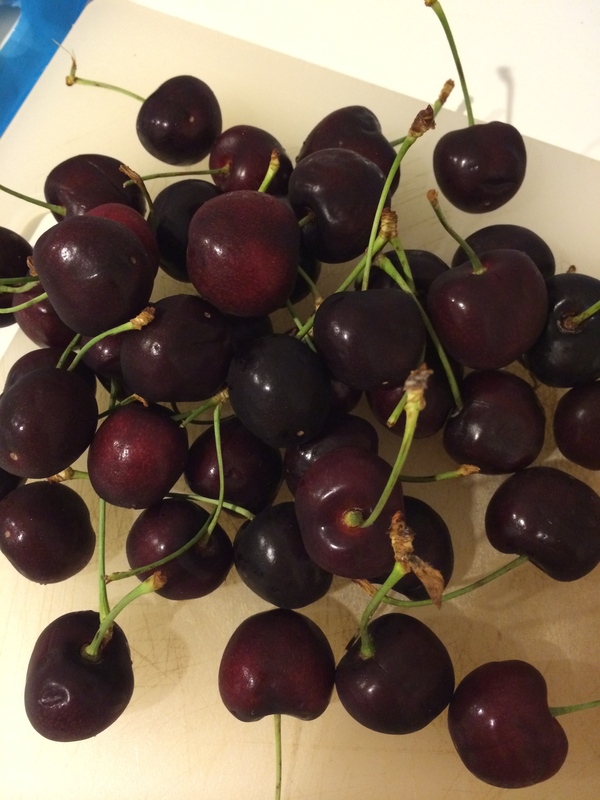 I have a bunch of cherries that I need to use so guess what??? YES, I am going to try your recipe, I hope it turns out as good so I can send it to Colorado tomorrow to my son! Great job! !